I received my potholders from the Potholder Pass Round 2 today! This time I was spoiled by Linda. 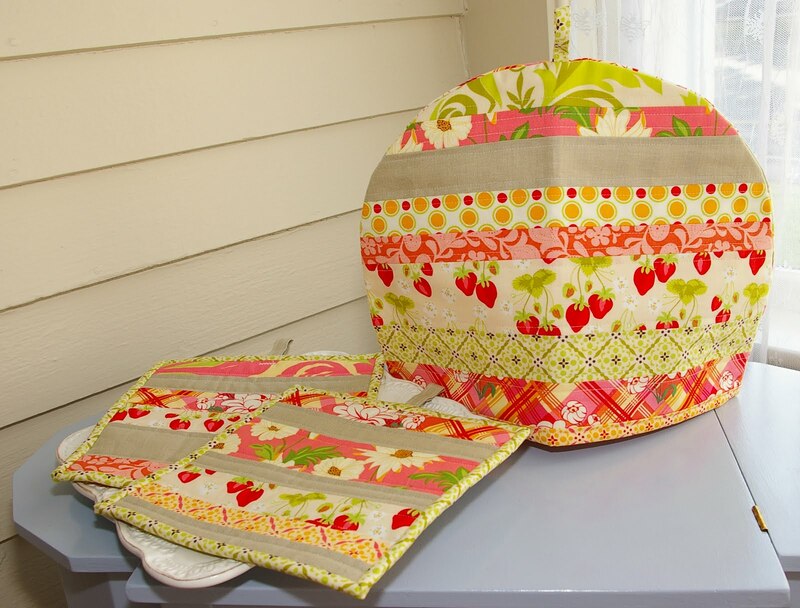 Linda made these gorgeous summery potholders AND a tea cozy! These pictures were taken in the sunroom where the lighting is best but the wall color is the same as in my dining room. There I have a soft green trim. The potholders and tea cozy look wonderful in there. And I am not a coffee drinker but a tea drinker. I don’t think I ever mentioned that anywhere so I can’t believe my luck. The tea cozy is modelled here by my china tea pot and it fits perfectly. I also love pink and gardening so the colors and the flower and fruit covered materials are perfect for me. The potholder backing is the strawberry fields print. I tell you, the thing about hosting the Potholder Pass is that it is torture. I see the pictures of the potholders popping up all month long and I know full well that none of them are for me because my partners are all smart enough to hide their work! So I have to wait and wait. It was well worth it though. Thanks Linda!